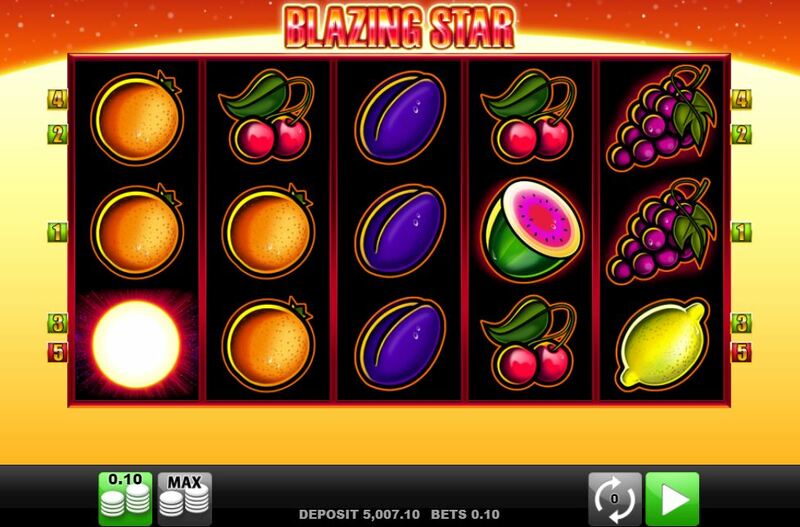 Blazing Star slot is a very basic slot, similar to Novomatic's Sizzling Hot and equally low involvement for the player. The old-fashioned slot music plays as we spin, and rapid taps when reels stop remind me of something I could have created on an old Acorn PC. The symbols fit with the era too so at the moment we have a totally anonymous game, but could it get our money moving? Now as soon as I mention '5 pay lines' you'll feel the anticipation of very high volatility coursing through your veins, as is the case with Merkur's Vampires and Knight's Life 5-lines, but unlike this game they have a bonus round. All we get here is 5 reels of 3 rows with all symbols stacked in the form of fruits, except for the Blazing Star (which is actually a Sun by the looks of things). 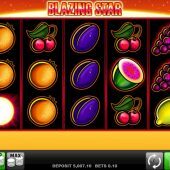 The single Suns pay us a huge 1000x bet for a 5-of-a-kind win with Grapes and Melons 200x, Plums, Lemons and Oranges 50x and the lowly Cherries a mere 40x. Unlike Sizzling Hot though there isn't even a basic scatter pay and wins only pay left-to-right here, but in common with that slot no Wilds appear either.